Memoirs about the war years. Memoirs about my service in the Computer Cener of the Scientific-Research Institute of the Defence Ministry of the USSR. Academic science history has been in deep crisis for many reasons; but the main one was its fornication with state ideology and politics: politics changed and state historians immediately began to teach events differently (or were out of action). Therefore, honest treatment of facts and objectivity from all those involved in the study of history and culture on duty, did not have to expect (DZURTUBAERV M. 2010: 830). Realizing this feature, I never even thought about doing history professionally and chose my life path in the field of technology. I was especially interested in electrical automation, in which my father was a specialist. 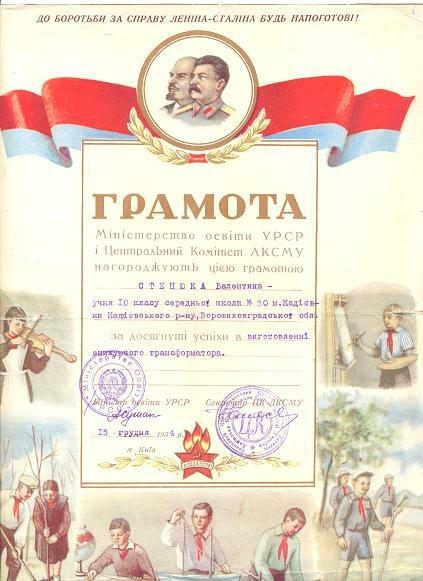 Left: Diploma for the manufacture of a transformer for the exhibition of technical creativity of schoolchildren. After graduation, I entered the Kiev Polytechnic Institute, where I studied at the Faculty of Electrical Engineering with a degree in Automation and Remote Control. 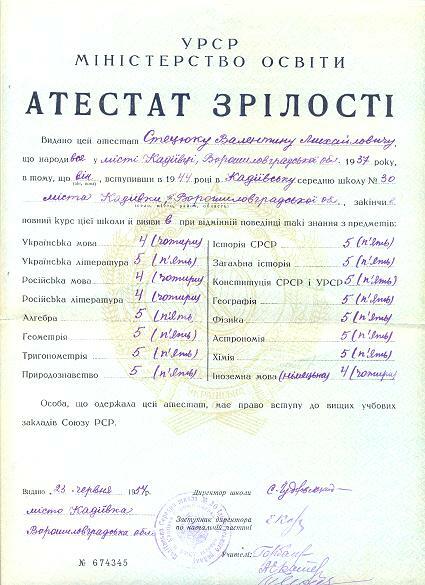 In 1959 I defended my thesis project "Radioactive liquid level gauge" and in the same year I was drafted into the army with the rank of lieutenant engineer. I served in the Computing Center as system engineer of NII-4 of USSR Ministry of Defense. It is in the settlement of Bolshevo (later the town of Yubileiny. Now in the city of Korolev) in the near suburbs. 1. STETSYUK V.M. 1987. Opredelenie mest poseleniya drevnikh slavian grafoanaliticheskim metodom. Izvestiya Akademii Nauk SSSR. Seriya literatury i yazyka. Tom Tom LXIV. Nr.1. – (In Ukrainian) – The Determination of Habitats of Ancient Slavs by Graphic-Analytical method. Proceedings of the Academy of Sciences of the USSR. A Series of Literature and Language. Volume LXIV:1, Moscow. 2. STETSYUK VALENTYN. 1998. Doslidzhennya peredistorichnikh etnogenetichnikh procesiv u Skhidniy Yevropi. Persha knyga. L’viv–K. – (In Ukrainian) – The Research of Prehistoric Ethnogenetic Processes in Eastern Europe. Volume 1. Lviv–K. 3. STETSYUK V.M. 1999. Do pitannya pro etnichnu prinalezhnist’ skifiv. Zb. Arkheometriya ta okhorona istoriko-kul’turnoї spadshchini. K. – (In Ukrainian) – To the Problem of the Ethnical Origin of Scythians: Archaeomerty, 3, K.
4. STETSYUK VALENTYN. 2000. Doslidzhennya peredistorichnikh etnogenetichnikh procesiv u Skhidniy Yevropi. Druga kniga. L’viv – K. – (In Ukrainian) – Research into Prehistoric Ethnogenetic Processes in Eastern Europe, Volume 2. Lviv-K.
5. STETSYUK V. 2001. Kulturni hrona Dnistra. Multynatsionalna kulturno-istorychna spadschyna Naddnistrianschyby. Ivano-Frankivsk. Lillea. – (In Ukrainian) – Cultural bunches of the Dniestr. Multinational Cultural-Historical Heritage of the Dniestr Land. Ivano-Frankivsk. Lillea. 6. STETSYUK VALENTYN. 2002. Slidi pradavn’ogo naselennya Ukraїni v toponimitsi. L’viv. – (In Ukrainian) – The Tracks of Ancient Population of the Uktaine in Toponymy. Lviv. 8. ROTH MECHTHILD, NOBIS RALPH, STETSYUK VALENTYN, KRUHLOV IVAN (Eds). Transformation Processes in the Western Ukraine. Concept for a Sustainsble Land Use. Weißensee Verlag. Ökologie. 9. STETSYUK VALENTYN. 2008. Seredniy Stoh ve Yamnaya kültürleri. Akedimik bakış. Cilt 1. Sayı 2. Ankara. – (In Turkish) – The Seredniy Stoh and Pit Cultures. Akademic Look. Issue 1. Number 2. Ankara.